Fresh eyes on London: City Boys! First the bankers, then the MP's with their expenses, now it's the city ducks. Theses chaps were having an altercation over Jessica or maybe it was Jemima, whoever she was she left with another chap and left these two to tough it out on their own. Wow - great action shot!!! I can just imagine the noise. Great capture. You can actually see the anger on that one duck's face! This picture is SO springy. Crazy ducks. Thanks for your support. Hope you have a great week! I love the background story the best! In the words of Harry Hill - Fight! I wonder, do you have your camera at the ready at all times - you do so well to capture the right moments whearas I always seem to get the "just moved" shots ! Donald Duck's fight club. Both these guys have broken hearts. Hello. I nominated you for the Awe-summ Blog Award on my blog. Check out my blog for details and stay awe-summ! 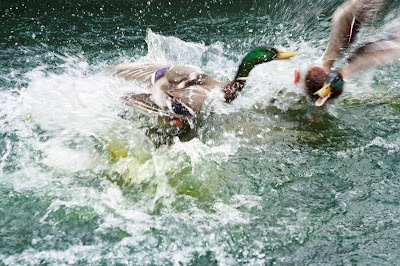 Of course, two male ducks are fighting each other for her attention. *lol* Great shot! So much movement ! Nice captured !! !